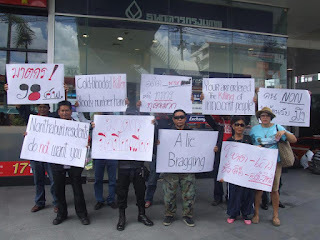 Asia Provocateur: Ordinary Thais' message to Abhisit is clear - "We don't like you or want you"
Ordinary Thais' message to Abhisit is clear - "We don't like you or want you"
Should anyone feel any sympathy for former Thai PM and present Democrat Party leader, Abhisit Vejjajiva? During three of his most recent public appearances he's been greeted with banners, baying mobs and angry locals. In Samut Prakan Abhisit was met by dozens of protesters who surrounded a building where he was supposed to take part in a seminar - the protesters prevented him taking part. When Abhisit went to Chonburi during a local election, 50 local residents berated him for "killing people". And today in Nonthaburi a few dozen ordinary Thais staged a protest outside a Democrat Party-sponsored seminar that Abhisit was attending. They held up banners in Thai and English saying things like "Nonthaburi residents do not want you" and "Cold-blooded killer." The reasons for this hostility are pretty obvious. Abhisit was imposed as Prime Minister, with the backing of the Thai Army, on the Thai people. For decades his Democrat Party have failed to receive a popular mandate to rule and Abhisit himself is perceived as arrogant, aloof and cold. That he then sent snipers to shoot the entirely legitimate protests that resulted from his party's undemocratic grasp on power speaks volumes about Abhisit's commitment to any kind of meaningful ethics or values. Yet, after shooting protesters, losing two elections, reducing his party's number of MPs, supporting the openly anti-democratic and extreme rightwing PAD and leading his party to violent protests in the Thai parliament Abhisit still clings, with almost pathological desperation, to his role as Democrat Party leader. He has also evaded any proper investigation for his actions in April/May 2010 and the resulting deaths of over 90 unarmed, Thai civilians. No wonder he's being hounded.